"To some, advertising executives exist at the fringes of legitimacy. We are neither hard-core business people nor scholars. We do not control the levers of capitalism nor offer academic insight. In fact, a few believe our profession is inherently corrupt, profiting from base human desires by transforming them into products pumped out of factories like processed cheese. On self-deprecating days, however, I remind myself that advertising people exist at the intersection of commerce and culture. Our ultimate goals have always been, first, to identify fundamental motivations for behavior and preference, and second, to translate these insights into revenue-generating consumer propositions. No matter what the product category or target demographic, insight and profit margin are inextricably linked. In order to transform a mouse into Mickey Mouse, we must be both amateur cultural anthropologists and unaccredited psychologists." I really like this book. It popped out to me in the Economics section at the university library, and in spite of its being so different from my usual reads (or possibly because) I picked it up at once. The introduction by Martin Sorrell and Doctoroff's utterly unassuming conversational tone of writing meant it immediately appealed to me. Tom Doctoroff is the CEO of J. Walter Thompson Asia Pacific. Based for more than a decade in China, he is considered a leading expert in Chinese consumer psychology. 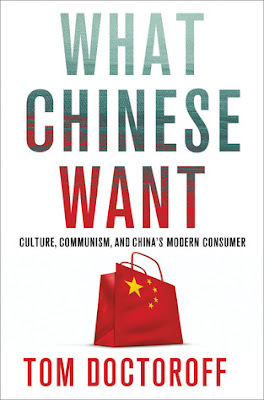 What Chinese Want: Culture, Communism, and China's Modern Consumer by Tom Doctoroff, reads the cover, with a blurb from Fortune that calls it "an invaluable primer on the culture and buying patterns of the Chinese." It is a major plus that Doctoroff does not require the reader to be informed about China. To the curious, the book will provide dollops of facts and insight. The book strives to be all encompassing and falls prey to some sweeping generalizations about the Chinese masses. But if taken with a pinch of salt, it sheds light on every tiny aspect of the Chinese psyche. What makes Chinese people tick?, Doctoroff wonders aloud. Their aspirations and expectations from life in contrast to the West, their history and how it has shaped them - the cultural insecurity, the obsession with brands, the stern hierarchy and lack of political flexibility, the anti-individualism - Doctoroff examines the effect each of these has on innovation in the Chinese context. He accompanies his observations and advice with stories of Western corporations that succeeded and failed in attuning to the Chinese interest and of local successes. Some interesting chapters, ones that I have already revisited more than a couple of times, are The Chinese Boardroom: Face and Fear, Illegal DVDs: Why Piracy Is Here To Stay, Barbie, Starbucks and Cofco: An Introduction to Chinese Consumerism and Car-Crazy China: Where Ego and Anxiety Collide. My favourite chapters belong to Part 4: Chinese Society. Here Doctoroff becomes more candid, describing some of his colleagues, his visit to the Shanghai Zoo, the Chinese Christmas. China is one, perhaps the only, culture which has remained unapologetically itself over the years, through globalization and advancement. He attempts to explain why. Here, it is strikingly evident that though often critical of its worldview, pointedly frank about its failings, Doctoroff is fond of China. He shows no scruples about being the master manipulator his industry requires him to be, but even so, he respects the Chinese, with all their stubborn foreignness. Joy in the corners: Happiness persists. The Chinese, despite limited means and honed self-protective instincts, are happy. The flip side of an insecurity-based worldview is an appreciation of minutiae. The con brio vigor of chess wars, muted by the buzz of gossip, is a delight. New York fireworks elicit howls of laughter. The morning bun hawker derives satisfaction from each sale. Old men take pride in their pet turtles. Every door is surrounded by plants, a sign of emotional investment in one's abode. Weddings are a joyful community affair. Neighbors unfold lawn chairs to relax, often in pajamas, and watch the world go by. "The Chinese are, simply put, the most striving, ambitious yet clear-eyed people on the planet and that counts for a lot. They are pragmatic, yet human, wary yet hopeful, patient yet quick to respond. They are the hope of their future. I'm betting on them." Doctoroff has an odd writing style, an uncertain mix of corporate bullet points and bold titles and faux-academic droning on. Some sections looked more like powerpoint presentations than I like my books. A few more anecdotes would have done the book some good; it is obvious that Doctoroff has many unique little experiences in China, it is unclear why he has used his first-hand examples so sparingly. Instead, he gives the same lesson over and over with slight modifications, like a well-meaning school teacher trying to ram it into our heads. "And what was it I said before, class?" "The Chinese are obsessed with brands and status!" "Why yes, now let's repeat that, on the count of three..." The book could have been cut down to half its size. That is the one complaint I have. As someone very interested in international relations and the future of humankind I realize how important China has become and will be in the coming decades. This books sounds like it offers a different but important perspective. As someone who has been in corporate America for decades, I could not help smile to your comments about the writing in this book resembling a Powerpoint presentation at times. Thanks, Brian. It is a very different book, maybe a little narrow in its focus, but interesting nonetheless.